The greatest advance in home heating in the past few decades has to be the Open Direct System invented by Radiantec. The Open Direct System uses a highly efficient condensing tank-style water heater that provides both radiant space heating and domestic hot water all in one unit cutting electricity requirements for those of us living off the power grid. There are no heat exchangers (unless you want to subsidize with solar hot water), no poisonous antifreeze and no complicated controls. The same water that flows through your floor, goes through your water heater/boiler and comes out of your hot water tap. Although this may sound strange, the pipe in your radiant heat system is no different from the pipe everywhere else in your home from the well to the taps. The secret weapon of this system is the Polaris PG10 34-100-2 hot water. It truly is amazing with a real efficiency of 96%. It can heat water as fast as you can use it (5-6 gallons per minute), has a stainless steel storage tank holding 34 gallons and has standby losses of only 1%. We love it and it has changed the way we heat our home and domestic hot water forever! We are saving about $400 CAD every year compared to burning wood. Contact kevini@radiantec.com and tell him SolarHomestead sent you. You will be well taken care of and he will be there to support you every step of the way. We have been recently been contacted by Radiantec of St. Johnsbury, VT.
Radiatec.com now has a Canadian distributor for the Polaris boiler/water heater. Buying from Radiantec’s Canadian distributor has two advantages…. First you will be able to have your Polaris shipped from Canada to Canada eliminating the border hassle. Second your Polaris will be complete with CSA approval keeping inspectors happy. Please contact kevini@radiantec.com and tell him SolarHomestead sent you. You will be well taken care of and he will be there to support you every step of the way. This high-efficiency heating system is designed to work in a radiant heat application as the water traveling through your floor needs to be approximately the same temperature as the water going to your hot water tap. Radiant heat applications use warm water (100-140oF) to heat your floor as opposed to baseboard heaters and radiators that use much hotter water (160-190oF). Here is how it works. When your zones (or a zone) need heat, the circulating pump will make hot water will flow from the water heater, through the check valve, through the pump, to the heating zone and back. This will heat your floor effectively and is pretty normal. 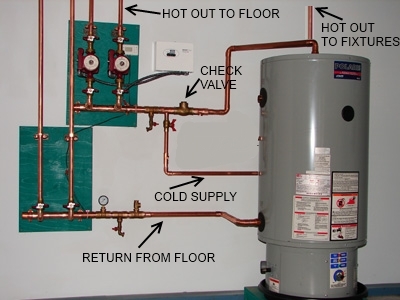 If you look at the above drawing, you can follow the hot water from the top of the water heater through the check valve, through the circulating pump(s), through the heating zone (floor) and back to the water heater. When you open a hot water faucet, cold water enters the system from the cold water supply (well or municipal water system), goes through the heating zones, and enters the hot water tank. This forces hot water out of the top of the water heater, into your hot water piping and out the hot water tap. In the above drawing, you can follow the hot water out the top of the water heater to the piping that leads to your hot water fixtures. The water is replaced by going from the cold water piping, through the circulating pump(s), through the zone and back to the hot water heater. By the time this cold water reaches the hot water heater, it has already been preheated by the floor. In the heating season, the cold water will be warm by the time it reaches the hot water heater. This doesn’t really save money as you have already heated that water with your Polaris water heater/boiler. Although this system works awesome in the winter, the real energy savings are in the summer as all the water entering your water heater has to go through the floor first. The cold water leaves your well (or municipal system) goes through all the zones of your heating system and is warmed/pre-heated. In the summer you can expect an increase of 10-20 degrees (for free) as the water flows through your floor. This cold water cools your floor in the summer and provides some free air conditioning. By the way we have never had any condensation build-up on any concrete, wood, ceramic tile or click flooring that is being used to pre-heat the water. The cold water will always flow through your floor first because of the check valve in the system. ALL ZONES MUST BE OPEN ALL THE TIME! 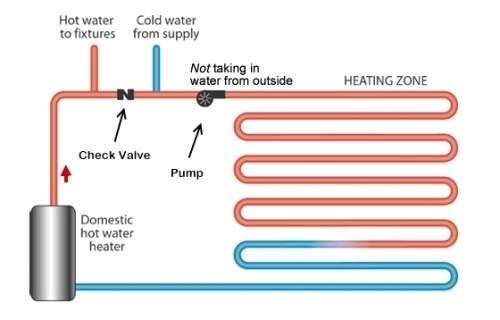 If you close a zone (heating loop) the water in that loop will get stagnant and could become a health risk the next time it is opened and that water is allowed back into the system if you drink your hot water from the tap (which most folks don’t). If you are planning on installing a solar water heating system, the open direct is the perfect companion. Look at the photo below. Every BTU collected with solar, will cut your fuel consumption. It is just a matter of plumbing in a new loop for the solar collectors if you live in a no freeze zone. If you live in the north, simply add a heat exchanger and antifreeze. The Polaris/open direct system will work for hot water baseboard heating. Hot water baseboard requires higher temperatures and the Polaris will handle it but the Polaris is not as efficient at higher temperatures. Another consideration is the resulting water temperature would be too high for bathing, showering or washing dishes. Make sure you add a mixing valve to the water heading out to your taps if you use the open direct system for hot water baseboard or radiator heating systems. A mixing valve is simply a device (that you connect your domestic hot water supply to fixtures and your cold water supply) that mixes cold water into your domestic hot water to lower the temperature to prevent burns at your taps or shower. They are adjustable to your preferred temperature and very reliable. We will do our best to find worldwide suppliers of these mixing valves ASAP. This system eliminates one of the biggest problems with radiant heating systems….air. In most radiant heating systems, air gets trapped in the piping and pumps making the system work poorly. In the open-direct-system, air is forced out of the lines every time you open a hot water fixture as the full pressure of your pumping system is plenty to flush out any air. No need for air traps as in traditional radiant or base board systems. Radiant heating systems work best at temperatures of 100-140 degrees F. The Polaris is designed to work the best at 100-140 degrees F. It is a match made in heaven. If you try to use a standard boiler with radiant heat, you will always be operating your boiler at a lower temperature than it was designed to operate or use a mixing valve. Mixing valves are not efficient in this situation as you are paying money to heat your water only to cool it down with a mixing valve. You only need to buy one hot water heater instead of a domestic water heater and boiler. This saves a lot of money and also saves standby losses. Every hot water heater you have will add another standby loss (through the sides and top) as well as an electrical load to your off-the-grid renewable energy system. The open-direct-system is incredibly simple and code approved by the International Code Council (ICC). Email us at support@solarhomestead.com if you would like the documentation supporting the open-direct-system. You WILL save on your heating and hot water energy costs. Think about the summer. Your floor is warm and the sun is shining. Every time you open a hot water faucet, cold water is directed through the floor, preheated and sent to the water heater. We see a 20 degree temperature rise in the middle of the summer in our home. That is a 100% free rise in water temperature. With a little extra plumbing, you can also direct all the cold water through your floor in the summer months. This can make a decent decrease in cooling costs and provide a much cooler home. We do this with our gardening watering system and it makes a huge difference in our bedrooms. We also feed our toilets with the preheated water to stop sweating on those humid days. The possibilities are almost endless. To make the open-direct-system work the best, the Polaris is the most reliable, inexpensive and well built heater available today. We installed our first one about 8 years ago. If we find a better unit, we will update this page immediately. off the grid, right now I am running 2000,watts in panels @ 48volts. that sounds like exactly what I need as well. Is it possible to get a hand drawing or schematic of the gear I would need , using the Polaris unit, just the purchase components/Circuity, I would do all the fittings and piping. or could you direct me where to get this. I need to pull the trigger on an efficient system like this in the near future. Good to hear from you. I will monitor the electricity consumption of the Polaris as soon as I can. I always have several projects on the go but I will try to make it a priority. As you are having 4-5 1/2″ loops I would recommend running a 1″ supply to a manifold that splits to your 4-5 loops. I would try to keep the loops at about 200 feet for the 10 watt pumps and 300-400 feet max for the 20 watt Ivan labs El Sid pumps. The all have 1/2″ male pipe thread at each end. At the end of the loops, tie them al back together going into a 1″ pipe and back to the boiler. Connect all the pump negatives directly to your 12 volt battery bank negative terminal and connect each positive to a thermostat for each zone and then back to the positive battery terminal using a 5 am MNEPV5 breaker (or a USM-1 fuse holder with a 1-5 amp fuse) inline for each loop. I have been using off the shelf 120 volt thermostats used for electric baseboard heaters with no issues for about 8 years although I would NOT normally use any 120VAC switch, fuse or breaker for DC electricity. I suppose the voltage and current is so low they will outlast me. I would highly recommend purchasing your Polaris from http://www.radiantec.com or by emailing kevini@radiantec.com regardless of the price as they stock them now in both USA and CANADA and there to help in times of trouble. Can’t recommend them highly enough. Have you had any experience with tankless water heaters and radiant heat, we are researching possibly completing our radiant heat open-direct system with a Takagi tankless water heater. We are also considering Polaris. We will have concrete slab with radiant heat and are looking at solar options. We appreciate any suggestions or ideas/advice you may have. I am very interested in this system, I am off grid in northern ontario. I have 1400 watts worth of solar charging a 24V & 700Ah battery bank (2 strings of 4 x 6V 350 Ah batteries). My fear is how much power consumption is required to run the circ. pump required to push water around as well as power required to run the ignition system & blower fan on these units (up to 7 months/year of heating). With limited effective solar in Winter months, will I have enough power to run this unit 24/7? Thanks for your comments and questions. Usually in an off grid system )such as yours) you would have different zones in your home using one 10-20 watt pump per zone. Then you control each pump with a thermostat. That way you are not running an inefficient big circulating pump (as in almost all homes) that runs anytime heat is called for in even just one zone or area. We have operated the Polaris on a 300 watt Morningstar Sure sine inverter with no trouble at all. When the water temperature reaches the low temperature set-point, the blower operates for 10 seconds to clear any propane out of the system to prevent explosion in case of a propane leak for example. The fan consumption is negligible. Next a 200-300 watt ignitor heats up for about 30 seconds and propane is released into the combustion chamber and is ignited. The second the propane is ignited, the heating element turns off leaving only the blower operating consuming very little electricity until the water reaches the required temperature. I will try to install an electricity monitor on ours and see what kind of consumption ours uses on a daily basis. There is nothing better at this point except keeping a wood stove burning 24 hours per day. We are in eastern Canada where the weather regularly goes down to 20-30 below 0C from the end of December to the end of February but I would guess you would be colder depending on your location. I am researching a hot water heating system to heat my off the grid house. I will be using a glycol mix to prevent freezing. I will be using a mix of radiant floor heat and cast iron radiators. Propane and possibly sun as fuel. efficiency of course is important. Thanks for commenting. Usually radiant heat is done with water temperatures around 120-140 degrees F and radiators are closer to 190 degrees F.
I would stick to a lower temp boiler like the Polaris or other condensing hot water heater/boiler. The radiators won’t be as hot but plenty to dry mittens and snow suits on and provide heat, especially if the water goes thru the radiators first and then the floor. To add solar simply add a stainless single wall heat exchanger. Have a vent at the top of your hot water collectors in case the heat exchanger leaks. This will force hot potable water (under pressure) out the vent making it impossible for glycol to get into your domestic hot water. Don’t use a double walled heat exchanger as these are less efficient. Expect trouble from your heating installer and building code officials as they tend to not think outside the box as we do. In winter, when using hot water (which introduces cold water into the radiant floor zone), doesn’t that end up cooling the floors (and associated space) you are trying to heat? 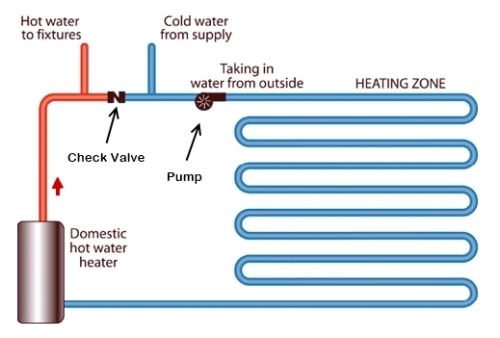 I see that exchange adds efficiency in producing additional hot water for future use (and the advantages of this in summer are obvious), but I’m stuck on the cooling effect to the space you’re trying to heat with the radiant zone during the winter season. Hi Brett, this is a common question with this system and Jody’s answer was perfect. One thing to ad is that any heat that’s taken out of the floor by running the cold water through is being put back into your water heater. So, other than the little bit of loss in the heat exchange process, there is truly no net heat loss on the system! The primary reason for this plumbing detail is safety. We need to make sure the water in the system remains fresh 365 days a year, especially for those months when the heating system isn’t being used. Sure, you could put in bypass valves that you open and close at times of the year, put in a timer, ect. But, who will remember to turn the valves every year? What if you sell the house, will this important detail be left out? How will you know if the timer isn’t working? This design ensures potability as long as domestic hot water is being used in the home. Would love to visit you and your facility the next time I get the family down to Smuggler’s Notch. Hi Jody, we’d love for you to stop by. We have a huge hydronic solar array that feeds an earth-bed under our slab in our 12,000 sf office/warehouse. Pretty neat. It is helpful to understand the nature of heat loss to the ground so that we can plan good strategies to reduce it. Very little heat is lost straight down with a slab on grade structure. Earth is not a very good insulator, but there is a great thickness of it so that heat does not penetrate much more than 3 feet. Of greater concern is heat loss off to the sides, and for that reason, we concentrate the insulation efforts there. The proper material for below grade insulation is extruded or expanded polystyrene. Other materials are prone to absorb moisture or do not have enough compressive strength or stability over time. Some promote a very thin sheet of air-bubbles with foil. This is not an acceptable substitute for extruded or expanded polystyrene. the slab. The methods are about the same as far as reducing heat loss is concerned. But the choice of insulation method can make a big difference in the ability of the building to store heating or cooling energy. If the insulation is placed vertically, the heat storage ability of the earth is incorporated into the building down to an effective depth of about 3 feet. This results in a building that can store large quantities of heating or cooling energy. Such a building can “coast” through the Spring and Fall seasons without large amounts of heating or cooling energy inputs. Such a building can also be designed to store alternative energies such as solar in an efficient and cost effective way. benefit from nighttime or weekend temperature setbacks. Hello! My wife and I purchased our current house (built in 2005) a year ago this June. We live in West central Minnesota in a 3,400 sq. ft. house on 10.5 acres. Our home is heated with an outside wood boiler with propane back up. Our 1st ele. bill when we moved in was right around $350. Since then, I’ve replaced all of our bulbs with LED and have managed to get our last bill down to about $175. Now I know that LED wouldn’t make that much of a difference but I’m sure it has helped. My question is: I would like to cut it back even more. What recommendations do you have? I’m looking into installing a supplemental solar-powered set up, possibly a wind generator down the road. For starters, I’m going to try converting the wood boiler circulating pump over to a 12v unit run off a battery bank and solar panel. The pump runs 24/7 from the time we fire up the boiler in the fall until Spring/early Summer. I’ve read that that pump consumes a very small amount of energy but if we can run it for no cost at all, I’m all for it. Next, I’d really like to hear more feedback about running a wind generator. I’m not sure how much you know about it but have read that if it produces enough reserve that we could actually sell it back to the ele. company. Any feedback would be great. Thanks in advance! We are moving to an 1100 sq ft bungalow which we want to take off-grid by adding solar. We live in Canada, just north of Toronto. Currently it is using an oil forced air furnace. We will be completely gutting the home and re-insulating with spray foam and updating all window with new efficient ones. We will also be installing a wood stove or fireplace with a wood insert. We will be removing the oil furnace and are considering our options that work best with solar. Similar to you most of our needs will be met with propane (cooking, clothes dryer etc). We are considering an efficient propane boiler with radiators (prefer radiant heat to forced air because it reduces dust and allergens) but this system you talk about is also intriguing. Here are my questions. 1. What kind of flooring can be placed over the radiant in floor heat? I’m told stone is best but I don’t want stone throughout (fine for kitchen, baths and entry). Does it work with hardwood or carpet? 2. Does the radiant flooring have to be embedded in concrete? If so do you need to consider weight and the load that your home can carry? 3. Does this system continuously draw from your well water or does it recirculate the water? Our well does not have the best refill rate at the moment. 4. Would a regular (efficient) propane boiler with radiator heaters and an on-demand hot water heating system be efficient, despite the added cost of purchasing two units? I’m curious – do you use propane gas with this? Do you have one of those big liquid propane tank? How much propane (or natural gas, if that’s what you use) do you estimate this system uses per month? I would estimate we consume about 400-500 liters per month (up to $260) for the boiler in the coldest months. Our home is poorly insulated with many windows. We used to use wood and would use 4-5 cords of wood per heating season at a cost of $325 per cord. Since we have 5 heating months per year, it cost us at least $325 a month for wood compared to $260 for propane. It is our plan and goal to connect to the power grid at some point so we can participate in net metering. Right now we dump tens of kilowatts per day in the summer that I could bank with the power company. Then I could use that banked electricity to operate a heat pump and heat my home at almost no cost. We also have a 2 kilowatt wind turbine that has been sitting for 3 years due to illness that would help us in our quest to get away from propane. I cannot say enough about the Polaris condensing water heater. It really has changed my life. Its crazy fast recovery and 95-96% efficiency is almost too good to be true. The exhaust coming out of the Polaris is barely lukewarm. You can put your face directly in front of the exhaust and it is not even close to being hot. Obviously wood is better from an environmental perspective but since I have been ill, the propane powered Polaris has been a God send. Hey, Has anyone thought of the day that one cannot obtain propane or any fossil fuel. Are you prepared for that? If you folks think that propane will always be available, think again! While I totally agree with you the day is coming when fossil fuels will either be unavailable or not affordable we have not focused on WROL or SHTF issues. But you have inspired me to add a section about how to survive a total economic crash which is inevitable with our (Canada’s) debt based fiat currency and more importantly the USA’s fiat debt based currency. The day is coming soon. I have been struggling a lot with my health lately and have not been able to tackle all the issues I have wanted. We have recently purchased a large steam engine from a world war two navy ship. It was fitted with a 120 volt DC generator capable of producing 2500 watts. Our goal is to mount it to a lumber mill as well as a Ford alternator to charge our 48 volt battery bank. We have 20 acres of forest and alder bushes that would be capable of running our steam engine for many years. I do not know of any other brands that perform like the Polaris with a small electric power consumption. Try http://www.radiantec.com as they are a stocking distributor in Vermont. In the summer time, is there any risk of the cold well water running through the heating loop and cooling the tiles above it so much that water starts to collect on top of the tiles (similar to water collecting on the outside of a glass of ice water)?